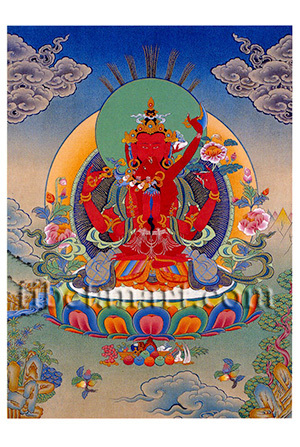 Jinasagara (Tib; Gyalwa Gyatso), meaning 'Victorious Ocean', is an aspect of four-armed red Avalokiteshvara, whose practice as a Highest Yoga Tantra yidam deity is of particular importance in the Kagyu Traditions of Tibetan Buddhism. Jinasagara is coral-red in colour, with one face and four arms, and he sits in vajra-posture upon a white moon disc and a multicoloured lotus. He is adorned with the five divine silk garments and eight jewelled ornaments of a sambhogakaya deity. With his principal pair of hands palms-folded in anjali-mudra he holds a wish-fulfilling gem in front of his heart. With his second right hand he holds a golden five-pointed vajra, and with his second left hand he holds a red lotus With his two principal arms he embraces his consort, Vajrayogini, who is ruby-red in colour, with one face, three eyes and two arms. She sits in sexual union upon his lap, her naked body adorned with the five bone ornaments, a five-skull crown, and her head tilted towards her left and she gazes upward towards the paradise realm of the dakini'. With her left arm she embraces her lord as she holds a nectar-filled skull-cup behind his neck, while with her raised right hand she circles a vajra-handled curved knife towards the ten directions.